A few months ago, a friend and I shared with each other our favorite passages of Scripture. Without hesitation, I included Revelation 21 in my list because of its promise of new heavens and a new earth. The book of Ruth and its picture of redemption has also been a source of much comfort in my life. Because of our different personalities and life experiences, I think it is somewhat inevitable that we will all identify with a particular passage or character from the Bible more than other ones. In His wise providence, God has given us a collection of diverse books that can speak to the diverse situations in which we find ourselves. Yet we will run into danger if we only study our favorite parts of the Bible. For “all Scripture” is given to us by God for our training in righteousness (2 Tim. 3:15–16). If we neglect any part of Holy Writ, we will be inadequately prepared to finish the race set before us (Heb. 12:1–2). Though the great heroes of the Reformed tradition devoted their lives to the study of the entire counsel of God, it seems that all too often we do not do the same. If you were to ask a group if anyone’s favorite book of the Bible was 2 or 3 John, I doubt that you would get many affirmative responses. It is also probable that many more would not pick Jude’s epistle as the most important book for their spiritual growth. The brevity of these letters does not seem to invite the same fervor that a book like Romans, or Genesis, does. This is most unfortunate, for, in addition to being God’s Word to us, these books speak to many of our current problems. Jude’s exhortations to contend for the faith take on special urgency after one hundred years of cult expansion and liberal higher criticism. The emphasis on love and truth in 2 John helps us to understand what it means to love each other in a culture that denies absolutes. Third John’s stress on our partnership in missions reminds us that we are not to idolize our wealth but instead give of it to spread the Gospel. For a culture enslaved to relativism and materialism, John and Jude remind us of the freedom Christ offers. These books, no less than others, are given for our edification. Let us therefore eagerly study them, and all of Scripture, so that we may hear the voice of God. 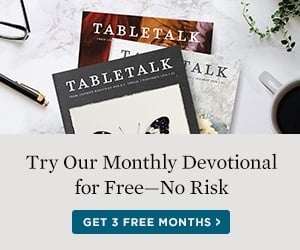 Robert Rothwell is associate editor of Tabletalk, adjunct professor at Reformation Bible College, and a graduate of Reformed Theological Seminary in Orlando, Fla. He has written the daily studies in Mark this year.